Tyshawn and Kasir Goldston have an almost telepathic relationship inside the boxing ring. Tyshawn trains his son, Kasir, and the duo have compiled an impressive resume. Kasir has won 109 of 117 amateur bouts and collected a dozen amateur titles, including three consecutive Junior Olympics and two Silver Gloves. 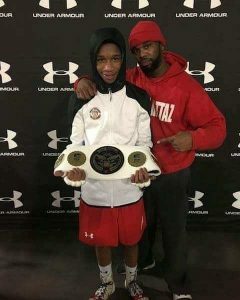 Kasir is currently ranked the nation’s number one fighter in his age group and weight class. He’s accomplished all of this, by the way, before celebrating his sixteenth birthday. “It’s beyond proud. Now I know that we’re destined to do this… This may be setting the standards too high, but it’s almost expected for him to win. When I call people and say he won, they’re not really surprised,” Tyshawn said. Kasir is also a running back for Albany High School, and the two sports don’t collide as one might think. Tyshawn uses football as conditioning training, which allows Kasir to focus on technique at the gym. In preparation for his last tournament, Kasir woke up at five in the morning to train before school. He hit the gym before football practice, and afterwards, he fit in a third workout before doing his homework. Miraculously, boxing doesn’t interfere with being a kid. The two try to keep “the gym at the gym” and when Kasir isn’t training, “Fortnite gets a lot of attention,” the two joked. Kasir is known as “King Mazzi.” A football coach gave him the nickname “Mazzi” because he’s fast like a Maserati. “I was fast on my feet, and that came into boxing because I’m fast with my hands,” Kasir said. It morphed into “King Mazzi” when he started winning titles. “I’m the king,” he simply stated. Kasir is also a quick student. It all began when he was eight. “We drove past the gym one day, and I was like ‘Dad, I want to box,’ and he was like, ‘you playing?” Kasir recalled. The two got the paperwork that was required, and they started the next day. “When I brought him into the gym, I tried him out, made it rough for him, and he liked that… He adapted faster than a lot of the other kids,” Tyshawn said. Kasir wasn’t joking then, and his ambition is no joke either. “I want to be better than Mayweather, better than Muhamed Ali. I want to be the best ever, and I’m determined to do that, I’m going to put in the work,” Kasir said with a smile. Those are lofty goals. No one can question the third generation boxer’s ability, discipline, and drive. Only time will tell where he’ll stand in boxing history. He has a great teacher in his father to guide him along the way. “I feel like the things that I learned, I didn’t learn to be a fighter. I learned them to be a trainer. My whole career, I always thought I have to be the champ, same with my father, but I feel like our knowledge was gained in order for us to give it to [Kasir]. We can give it to him in instructions from the trials and struggles that we’ve been through or seen,” Tyshawn said. He spars with pro fighters such as Will Madera, 27, an undefeated fighter also from Albany. “He always taught me to never fear anybody,” Kasir said about his father. Kasir’s physical talents coupled with his work ethic is apparent, but his bond with his father may be his greatest gift. “Dynamic Duo. I like saying that. I think that our bond inside and outside the gym is strong. We argue here and there, big arguments, but by the next day, we’re cool. He’s my father, but he’s also my friend, I can tell him stuff… I wouldn’t change it for anything,” Kasir said. Inside the ring, King Mazzi is a Swiss army knife. He can fight in a variety of styles, and more importantly, he can do them well. “We watch a lot of many different boxers, and we are able to put all those styles in one. So people don’t really know which Mazzi they’re going to get,” Tyshawn said.